Orlando features a humid subtropical climate and has long been one of Florida's most popular vacation destinations, attracting visitors all through the year. The city of Orlando will not disappoint when it comes to weather, with plenty of year-round glorious sunshine and summer temperatures often reaching more than 35°C / 95°F, averaging 30°C / 86°F between April and October. The autumn climate in Orlando tends to be the wettest period, with heavy downpours, although showers rarely spoil the day and generally clear quickly. Average daytime temperatures during Orlando's winter months are boosted by the sunny weather and regularly exceed 24°C / 75°F. However, evenings tend to feel much cooler at this time of the year. 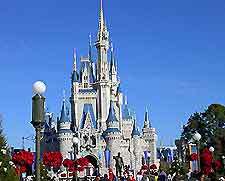 The average annual daytime temperatures in Orlando are around 28°C / 83°F.